Palm Sunday and Blessing of the new Choir Stalls. The palm crosses are made from the leaves on a palm tree and these represent the palms that the people of Jerusalem greeted Jesus when he made his entrance into Jerusalem on a donkey. The children were excited because the vicar had agreed to allow them to learn how to make some palm crosses all by themselves! 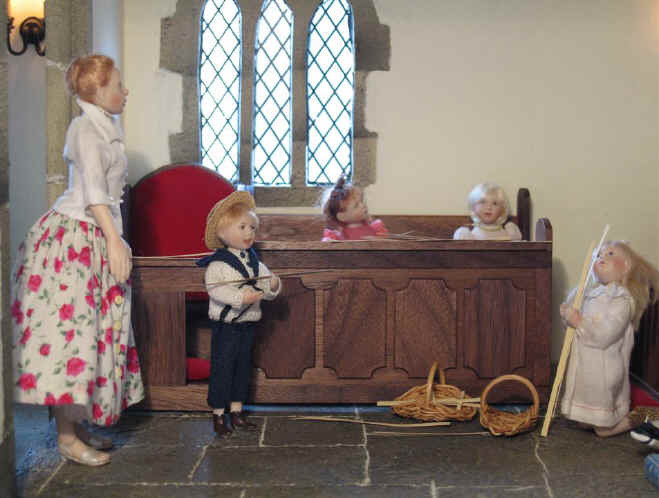 The children had to promise to arrive especially early on Palm Sunday morning before the congregation so that they could help make some. 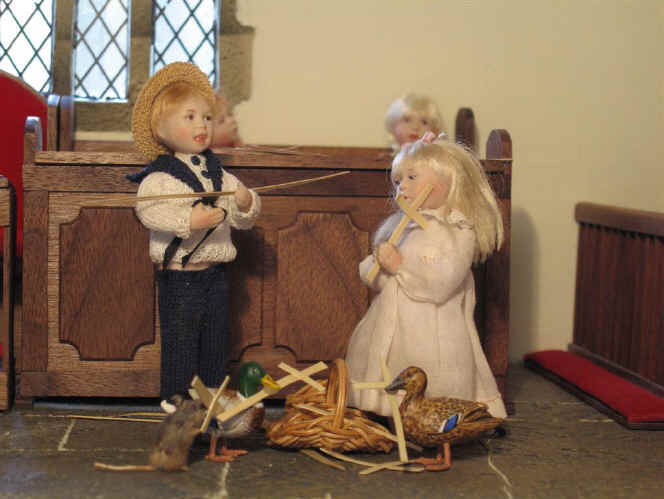 Ben and Tom have arrived at church laden with the palm leaves with which they will learn how to make into palm crosses. Can you see something new? It is the new set of bells in the church bell tower. 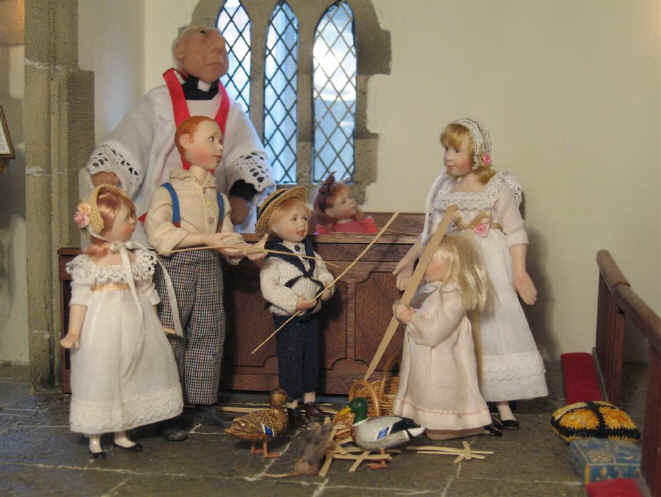 The vicar has promised the children that he will have them properly blessed next week on Easter Sunday! 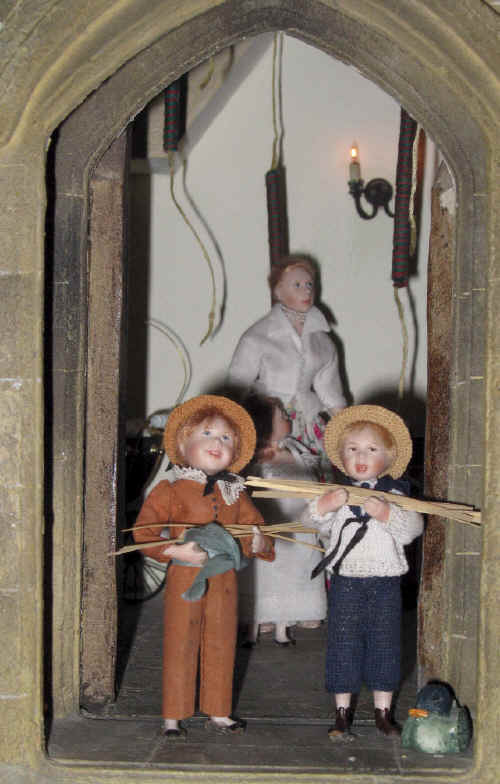 The Sunday School teacher, Miss Esther, is looking on as the children arrive. She will help teach them how to make the crosses. There is also some new furniture in the new chancel. St. Hilary's have now got some choir stalls! The vicar has just consecrated them for service in St. Hilary's Church. Tom and Ben have been asked to put the palm leaves on to the music stand on one set of choir stalls. Amelia and Phoebe have now come along and are waiting to learn how to make the crosses. Priscilla Jane and Tom are really interested and are even trying to make a cross before being shown how! 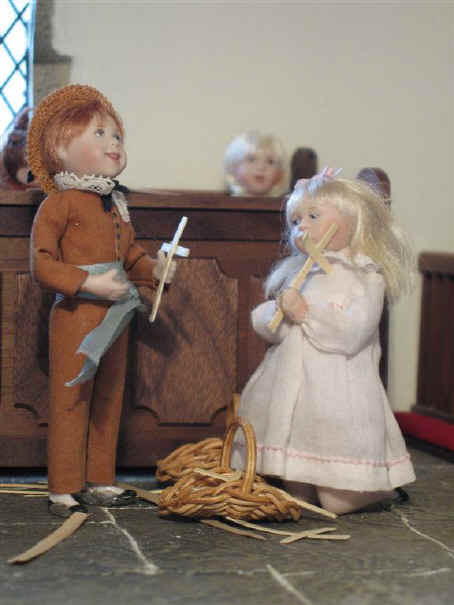 The vicar has asked young Ambrose to come along with Alice to help the children. He is now going to demonstrate how to make a cross with one palm leaf. Have you noticed anyone else join in the lesson? 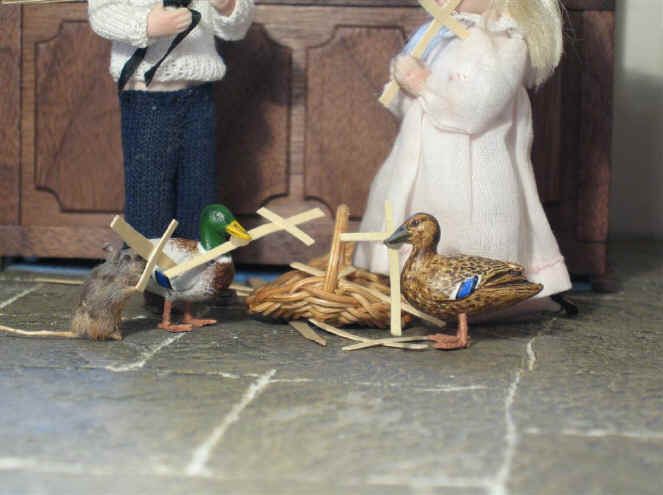 It is none other than Sepp, the rat and Esme and Ernest the local mallard ducks who live in the village pond. Oh dear! What a mess they have made! They have been looking at the ready made crosses in an attempt to see how they are made before the lesson and have spilt them on the floor! As you can see Adele is NOT the least bit interested in this lesson on how to make a palm cross. She is more interested in practising how to use the new candlelight snuffer and lighter! Already she is in the sanctuary pretending she is going to light the candles on the candleabra! The altar has now got "The Lord's Prayer" placed on it so that the children will always be able to remember it when they pray at home and in church. Ben and Priscilla Jane have beaten all the other children and have made a perfect cross on their first attempt. Oh dear! Tom is still struggling with making a cross out of his palm leaf. He has come over to Priscilla Jane to ask her to help him make his as perfectly as hers! Have you noticed who else have managed to make palm crosses? It is none other than Sepp, the rat and Esme and Ernest the local mallard ducks who live in the village pond next to the church. How clever they are to have made their own crosses! The congregation were thrilled to have their palm crosses because they were told how hard the children worked to make them. 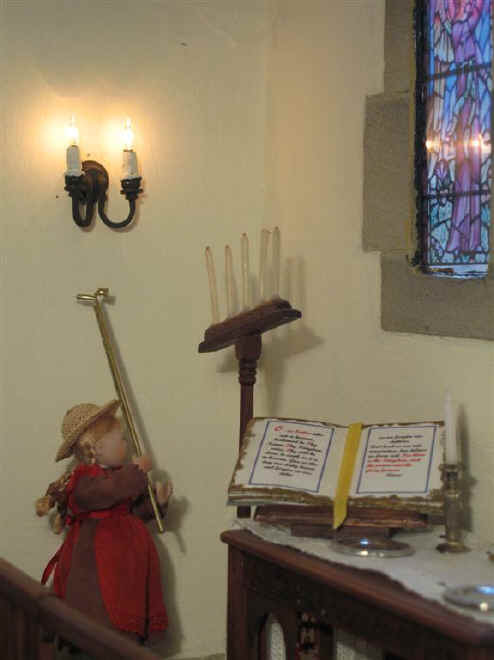 Many thanks to Mark and Sharon Stockton of Stockton Miniatures for our new choir stalls AND the extra lovely gifts of the candlelight lighter/snuffer, book stand and "The Lord's Prayer" that is now sitting on the altar. Visit our Prayer Time page to find out more about "The Lord's Prayer".